Competition forces battery makers to either match the scale or carve out a niche -- neither of which proved to be compelling for S&C. 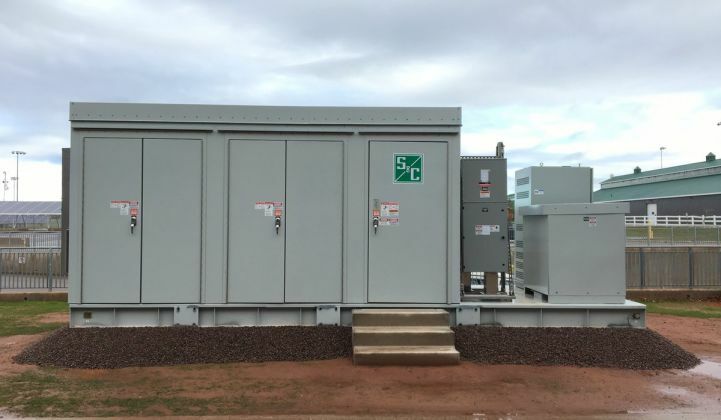 Chicago grid equipment company S&C Electric built its first large-scale battery storage system in 2006, before almost anyone else was doing it. Now, it's winding down that line of business. Storage will still feature in its microgrid offerings, but the employee-owned company will procure it rather than producing it in-house, said Senior Director for Business Development David Chiesa. Meanwhile, S&C is refocusing on what it sees as its core competency: medium-voltage switching and protection, with a special focus on microgrids. The move reflects the maturation and consolidation of the market in the 12 years since S&C built its first utility-scale battery, a sodium-sulfur unit for AEP. Demand for batteries has boomed, and a crop of electric-vehicle producers has established gigafactories to mass-produce battery cells and packs. "We have other people in the marketplace who are taking single-use-type energy storage systems and just throwing them at the market for some incredible prices," Chiesa told GTM at DistribuTech in San Antonio. "That high-volume manufacturing game has never really been what S&C is great at. We're a standard manufacturer that features lots of customization to our standard products." That competition forces battery makers to either match the scale, which isn't feasible in this case, or carve out a niche. "For years we survived in that specialty space, because we knew how to integrate the really hard jobs," Chiesa said. In the current, not-yet-fully-formed energy storage market, market design and regulatory structures prevent storage from making money on the full range of technical services it can provide. Vendors are innovating in anticipation of the expected hockey-stick growth curve, but finding a present-day buyer is a different story. "One of our systems came with 12 use cases pre-engineered into the system," he said. "Do you know how much value we got for that in the marketplace? None. You can only use three or four at a time." The baked-in versatility meant a customer could easily change use cases years down the road without an expensive retrofit, but again, that's not a monetizable value at this point. It's hard to make money by building out product values that aren't yet monetizable. The dilemma facing many early entrants into the storage industry is how much to invest in storage expertise before there's a large enough market to support a thriving ecosystem of vendors and installers. Some battery vendors have fallen off in the last year. Aquion and Alevo tried to commercialize unconventional battery formulas, but went bankrupt before they were in the money. Others further down the value chain have gone the route of acquisition, giving up independence in exchange for the financial backing of a larger corporation. Green Charge, Demand Energy and Greensmith went that route, and after a period of corporate integration, can now leverage their backers' balance sheets and reputation to scale. S&C isn’t a startup -- it’s been manufacturing grid equipment since 1911. Switchgear, reclosers and automated controls form the core of its business. Storage grew out of that expertise; it offered another way for utilities to intelligently control the flow of power on the distribution grid. At a certain point, though, the company had to decide if it would keep the storage practice and weather the turbulence. "When we recognize we need to change, we have a responsibility to our employee-owners, just like a public company does to its shareholders, to do the best thing for the company," Chiesa said. "As this market has matured, the best thing for us was to transfer to a purchasing strategy as opposed to a manufacturing one." Consolidation among storage manufacturers squeezes out costs and inefficiencies, ultimately driving lower prices. It also homogenizes the product offerings. These days, the industry is falling into two camps. Lithium-ion production is getting cheaper and more centralized as manufacturers reach gigafactory-scale. The other class of manufacturers is trying something completely different, such as flow batteries for long-duration storage. It's go big, go niche -- or get out.